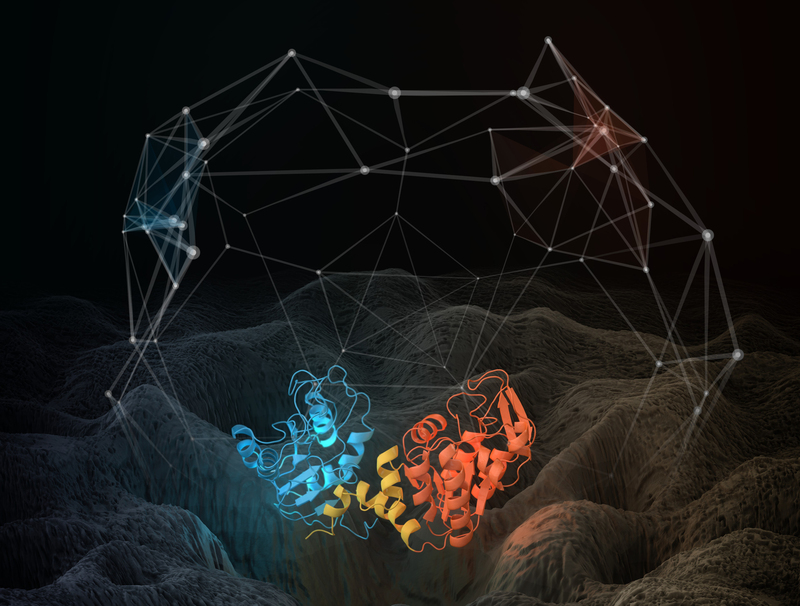 OAK RIDGE, Tenn., Nov. 23, 2015—Supercomputing simulations at the Department of Energy’s Oak Ridge National Laboratory could change how researchers understand the internal motions of proteins that play functional, structural and regulatory roles in all living organisms. The team’s results are featured in Nature Physics. Studying proteins—their structure and function—is essential to advancing understanding of biological systems relevant to different energy and medical sciences, from bioenergy research and subsurface biogeochemistry to drug design. Results obtained by Smith’s UT graduate student, Xiaohu Hu, revealed that the dynamics of single protein molecules are “self-similar” and out of equilibrium over an enormous range of timescales. With the help of Titan— the fastest supercomputer in the U.S., located at the DOE Office of Science’s Oak Ridge Leadership Computing Facility—Smith’s team developed a complete picture of protein dynamics, revealing that the structural fluctuations within any two identical protein molecules, even if coded from the same gene, turn out to be different. Understanding the out-of-equilibrium phenomenon has biological implications because the function of a protein depends on its motions. Two individual protein molecules, even though they come from the same gene, will not function precisely the same way within the cell. The team also discovered that the dynamics of single protein molecules are self-similar, or fractal over the whole range of timescales. In other words, the motions in a single protein molecule look the same however long you look at them for, from picoseconds to hundreds of seconds. By building a more complete picture of protein dynamics, the team’s research reveals that motions of a single protein molecule on very fast timescales resemble those that govern the protein’s function. To complete all of the simulations, the team combined the power of Titan with two other supercomputers—Anton, a specialty parallel computer built by D.E. Shaw Research, and Hopper, the National Energy Research Scientific Computing Center’s Cray XE6 supercomputer located at Lawrence Berkeley National Laboratory. This research was supported by the DOE Office of Science through an Advanced Scientific Computing Research (ASCR) Leadership Computing Challenge (ALCC) allocation and funded in part by a DOE Experimental Program to Stimulate Competitive Research (EPSCoR) award. The Oak Ridge Leadership Computing Facility and National Energy Research Scientific Computing Center are DOE Office of Science User Facilities. ORNL is managed by UT-Battelle for the Department of Energy’s Office of Science. DOE’s Office of Science is the single largest supporter of basic research in the physical sciences in the United States and is working to address some of the most pressing challenges of our time. For more information, please visit http://science.energy.gov.